← Marketing Tip 19: If you have a website, have clear ‘call to actions’. 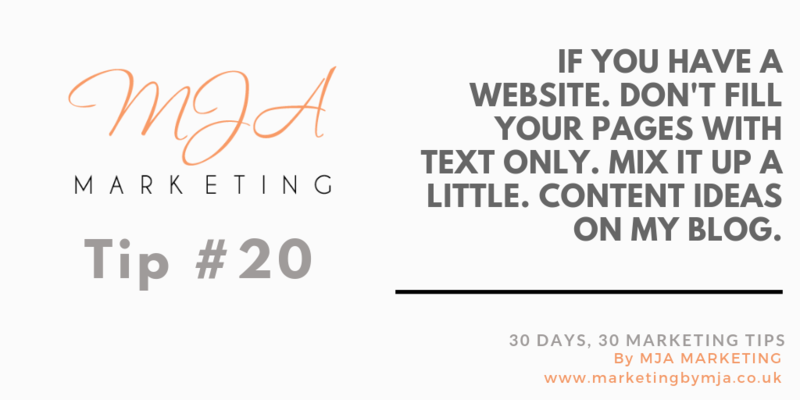 Marketing Tip 20: If you have a website. Don’t fill your pages with text only. Mix it up a little. Marketing Tip 20: If you have a website. Don’t fill your pages with text only. Mix it up a little. For ideas on the different types of content you can publish, read my blog on content strategy. This entry was posted in 30 days, 30 marketing tips, Digital Marketing, SEO (Search Engine Optimisation), Website Design. Bookmark the permalink.